Offering the Colorado Springs’ area the most comprehensive and effective physical therapy and sports rehab treatments, the Springs Integrated Health team helps clients of all ages to achieve pain-free movement without the use of medications and invasive surgery. 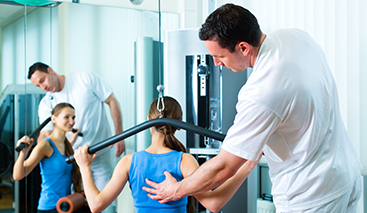 Caring for those who have suffered from auto accidents, sports injuries or workplace incidents, we provide each patient with expert-level physical therapy and functional medicine in order to help achieve optimal wellness. Our approach to physical therapy includes a number of modalities and health care measures, ensuring quick recovery from symptoms. Promising unparalleled results, we combine physical therapy techniques with chiropractic care and other functional medicine to increase range of motion and flexibility while diminishing any pain and discomfort. We also provide at-home physical therapy exercises to complement and speed up in-clinic treatment. Discover the difference that dedicated, focused care can truly make by contacting our physical therapy team today. We offer new patients a free health assessment delivered in comfortable, inviting settings. Contact us now.